I spent 20 years in the Army, I retired April 30, 2011. When you retire from the Army you have to go thru hours upon hours of training and classes about your benefits and tons of other less important topics, however, in one of these briefings they told us about the post 9/11 GI Bill. If you qualify, then you are entitled to the normal GI Bill PLUS basic housing allowance at an E5 level, what all this jibber jabber means is that I could go to school free of charge and draw an extra $1200 a month walking around money. So I decided to go back to school at the tender age of 44, who wouldn't? 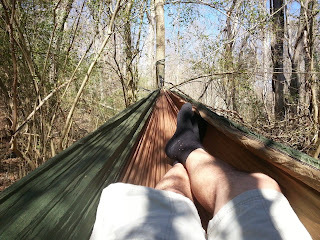 I know, I'm thinking the same thing, what does any of this have to do with hammock camping? Bear with me, I swear I will get around to hammocks. The school I attended, Methodist University, is about 45 minutes from where I live. I tried to schedule my classes as close together as possible but that proved very difficult, especially classes with labs, so I inevitably had breaks between classes sometimes as much as 3 or 4 hours. This was great study time and I was a much better student at 44 than I was at 18 but even so I needed something else to do with my time. 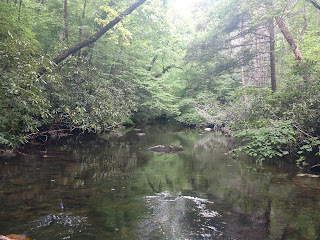 Methodist has quite a bit of wooded area along the Cape Fear river with a great trail system, so me being me, I started using/wasting my long breaks between classes on these trails and fishing in the Cape Fear river. I also really enjoyed finding a nice sunny spot on the bank or in the woods and resting my eyes for a few minutes, you know, to get ready for the next class. There were always bugs, rocks and roots, or the ground was wet and I just couldn't get the rest needed to prepare properly for study. That year when my mom asked what I wanted for Christmas I new exactly what I needed, an ENO hammock in stealthy subdued colors. The rest is history as they say, that ENO had a permanent home in my book bag from then on. 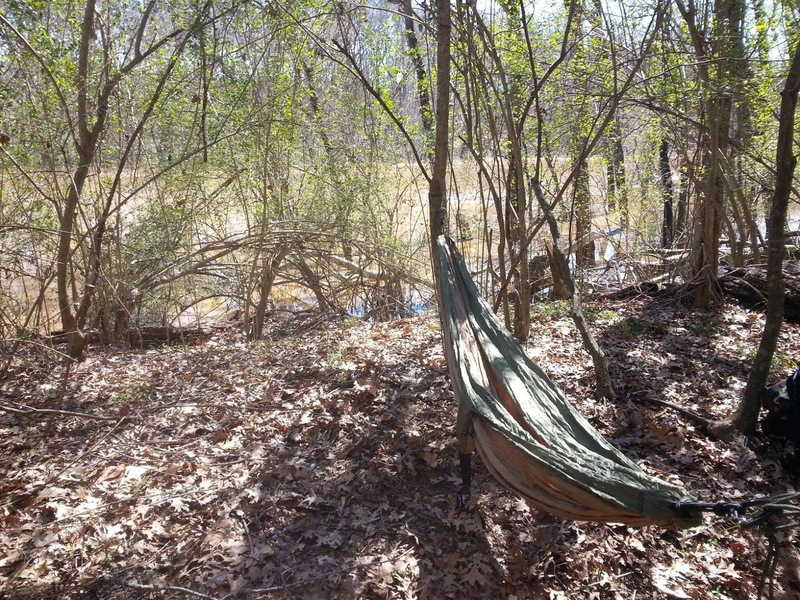 Here is a pic of that hammock down by the Cape Fear and of me getting ready for chemistry lab. I still have that ENO and use it to lounge around in but for serious camping I have other designs that I like better. There are literally dozens of sites, forums and groups that will tell you every detail possible about hammock camping so I am not going to bore you with minutiae, I will just tell you what I have found that works for me. 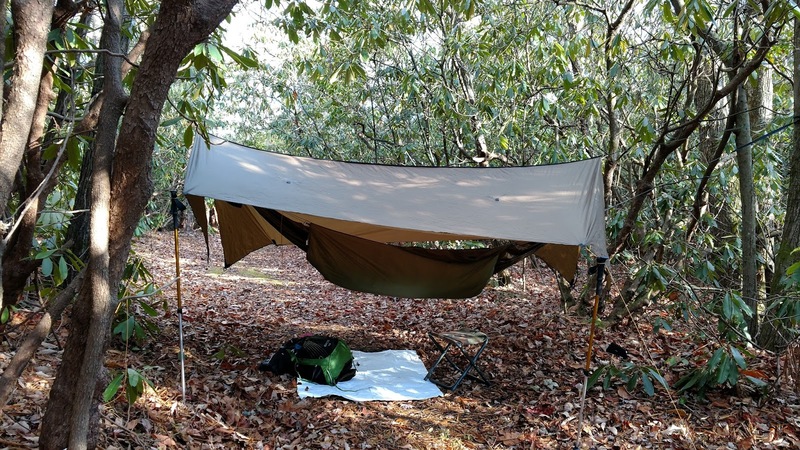 But if you decide to delve into minutiae and embrace hammock camping I can not think of a better place to learn then Sean Emery's Youtube channel Shugemery. He knows far more than I do about hammocks and is also a lot more fun to watch. 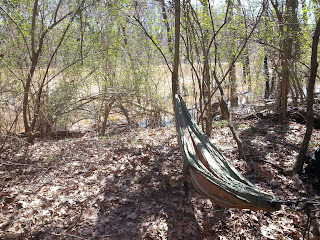 My current camping hammock is made by Dutchware gear it is the 11 foot netless model and is by far the most comfortable hammock I have ever slept in. My tarp is a Warbonnet Superfly it is a bit large and heavier than some but is absolutely bulletproof and large enough to provide full coverage. Last spring myself, my good friend Kevin Ingram and my son went through the worst storm I have ever rode out in the woods. I know there were tornado warnings and I swear I believe one went over us. Laying in the dark listening to the wind and the rain howling and the big dead hemlock snags crashing down around us I was snug and dry, scared to death, but I was snug and dry. A big problem with hammocks is that you are suspended up in the air and have nothing below you to trap heat or block the wind. Without some sort of barrier you will start getting cold at about any temp below 70 degrees. If you try to use a regular sleeping bag it will work better than nothing but the insulation in the bottom of the bag, no matter what type of insulation, will be compressed and next to useless. With any insulation it is the loft that traps air that keeps you warm, the more you mash it down the less effective it is. You can use a regular camping pad in a hammock, like you use for sleeping on the ground and it will work, somewhat. Most ground pads are too narrow so you are constantly touching the side of the hammock and at 40 degrees or lower it is like touching a block of ice, also they never stay put and you wake up all night cold and have to readjust the pad. Human beings, being the adaptable species that they are, came up with a perfect solution, it is called an underquilt. An underquilt is like the bottom half of a sleeping bag that is suspended under the hammock where it can hang up against you in all it's lofted glory. It really has to be experienced to be believed, a properly installed underquilt is like sleeping on a heated mattress, in my opinion if you are serious about hammock camping an underquilt is an absolute must for anything under 65 degrees. The underquilt I use is the Greylock 3 from Jacks R Better. I am very well pleased with it and will be using it tomorrow night in temps down to the 30s on Wilson's Creek. Here is a pic of my setup with the tarp up high so I can see out, you can also see the underquilt attached. The next piece of gear that is needed is some sort of top insulation. If you already have a sleeping bag then it will work just fine except for a little bit more weight to carry, if not then a top quilt to go with the bottom quilt is perfect. It is simply the top part of a sleeping bag with a footbox sewn in, when matched up with the underquilt it is warm and snug. 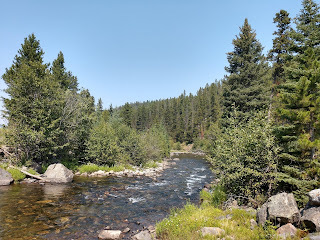 I use the Revelation by Enlightened Equipment for winter camping and a $30 DIY made from a down throw from Bed Bath and Beyond for summer camping. And that's it, the most comfortable backcountry sleep system I have ever used. I know it seems like an awful lot of really specialized, expensive gear but when you start comparing it to a backpacking tent, premium sleeping pad and sleeping bag it is very comparable. If anyone has any questions ask away.